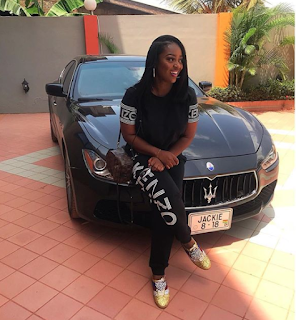 Ghanaian Ghallywood screen goddess, Jackie Appiah is cruising in peace, launches her new 2018 ride – customized Maserati and shared a photo of it on her social media handle. The classy queen has once again shown us that ‘quality and wealthy bees do not make noise’ and has always remained peacefully in the background whilst others keep on chanting for fame and attention. Jackie Appiah in just a few moments ago caused a huge confusion on social media when she just posed calmly in front of her new car – 2018, self-customized Maserati and shared the photo with her fans.